Tableau is loved by data analysts for the ease with which it allows them to generate insights and gain clarity from rich and complex data sets. However up until now Tableau has fallen short when the data being analyzed contains personal information or is otherwise sensitive to the point of the analyst not being permitted to query it. Aircloak Insights, our platform for analyzing sensitive data, allows organisations to make sensitive data sources available to internal and external analysts alike. It acts as a proxy that is installed between the analyst and the data being analyzed — and dynamically and automatically anonymizes the results of SQL queries as they are run. No Personally Identifiable Information (PII) ever leaves the Aircloak system, and one of it’s main strengths is that it *dynamically and automatically determines what is PII *in the context of a given query. This allows for a much more fine grained anonymization than what is commonly applied — yet by being truly anonymous, data analysed using Aircloak Insights fall outside the realm of privacy regulations such as the General Data Protection Regulation (GDPR). 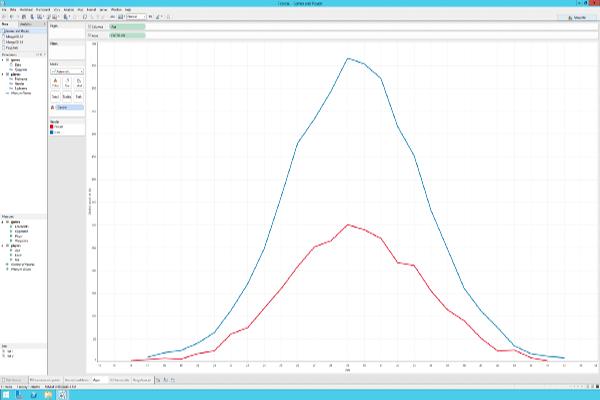 With Aircloak’s Tableau integration analysts can now connect their Tableau Desktop installation directly to their in-house Aircloak Insights deployment. This can be done in any Tableau installations that have the drivers for the Tableau Postgres integration installed as Aircloak Insights looks like a regular Postgres database to Tableau. Once configured analysts work with their Aircloak Insights data sources like they would with any other. The crucial difference however is that the results they get in Tableau are always safely anonymized, and that there is no risk of accidentally (or intentionally) exposing individuals, or breaking data protection and privacy laws. Organisations can now liberally share data across business units and external partners without the risk of sensitive data being accidentally leaked or misplaced. 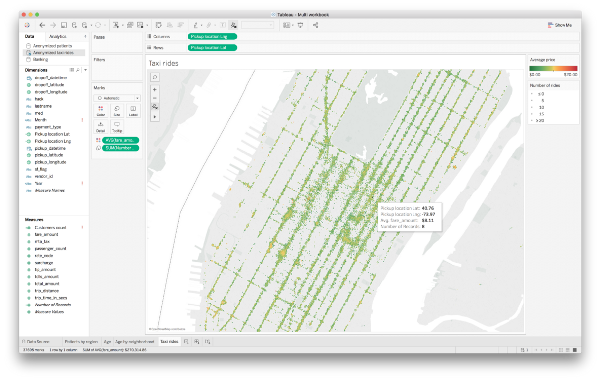 The combination of Aircloak Insights and Tableau truly democratizes access to rich but sensitive (personal) data. Shows the frequency of pickups as well as average fare from different locations in NYC. Let’s take the NYC Taxi database released to the public in 2014 as an example. It was thought to be anonymous and safe when released, but the protections applied where famously undone within a very short period of the release. Had the data been shared using Aircloak Insights instead one could have generated most of the useful insights that have surfaced, yet would never have been able to expose neither the individual taxi drivers nor the customers they served. The advantage of the Aircloak Insights platform is that it always safely anonymizes data with near zero configuration. And furthermore it does so irrespective of the type of data that is analyzed or the particular use case. This makes it possible to generate anything from simple visualizations to multi-page stories, bringing to life the stories hiding in your data. Please feel free to reach out if you have questions about Aircloak Insights, our integration with Tableau, or just want to talk about technology, analytics and anonymization. You can reach us on twitter at @aircloak, or me personally under @probst. If you prefer email you can reach us at solutions@aircloak.com.